I don’t recall the publication, but I certainly remember the moment and it marked a turning point for me—I was ready for something different, musically. Much of the music I had been listening to, at the time, was from larger commercial record labels with corporate directors and production teams, where artists rarely could steer their music in a direction of their own making. As much as I admire well-produced, engineered and recorded works of all sorts, the review I was reading in the late 1990s intrigued me enough to find a copy of East River Pipe’s “The Gasoline Age”. 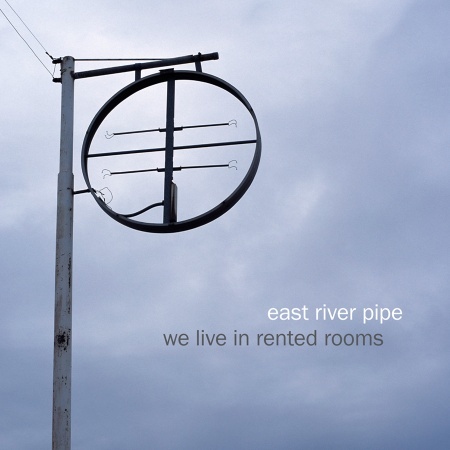 East River Pipe is F.M. Cornog (aka, Fred) and his early adult years were apparently rather dark and mired with substance abuse and a brief encounter with homelessness. Eventually, with the assistance of a woman named Barbara Powers, F.M. recovered and she helped him acquire recording equipment to write songs. Years later, F.M. would marry Ms. Powers. F.M. does not play live, or tour and he records alone, initially in his bedroom and now in a compact home-studio. He has a small and devoted fan base. His equipment is mostly low-tech (at first a 4 track portable) and though he has updated to digital recording his set-up remains simple. He writes his own material, plays the instruments, sings, produces, records and determines the direction of his own artistic expression. As far as I have read, his label Merge Records lets him do what he wants with his work and material is released on no particular schedule except when F.M. says the work is ready. I admit that for some, his music will be an acquired taste, but he writes on subjects that often cut right to the bone with reality. Artists such as Lambchop, David Byrne, The Mountain Goats and Okkervil River have covered his songs. F.M. tells stories; some are stark, tragic and perhaps echo aspects of his own past. He also captures a mood and its color with a remarkable depth that belies the simplicity of a given song. Many of his songs are short, some seem like hooks or choruses without verses like “Wholesale Lies” from “The Gasoline Age”. In many ways, Fred writes with a clarity and sharpness as Ernest Hemingway wrote. What one hears in the words, melodies and instrumentation is all that’s needed to express the thought, nothing else. Married and now with a young daughter and a day-job at Home Depot, Cornog’s releases are less frequent (5 years since his last), but his songs are still keen yet with slightly more atmospheric arrangements. The songs on “We Live In Rented Rooms” observe human conditions, provide social commentary, defend the defenseless and for some dream about what is likely unattainable. Some might think the subjects are a downer, but in many of the songs there are glimmers of hope in a verse, a chorus or a catchy melody. They are the kind of songs that can make one stop and think about one’s own situation. I suppose that one might have to be in a certain frame of mind for listening to this album. “Backroom Deals” opens the album is a piece about the annoying realities of making it through a workday for many. Despite the melancholy of the languid almost defeated rhythm of the piece it’s punctuated deftly with guitar and electric piano to make it to quitting-time. “Summer Boy” is possibly the reality of a local who watches the comings and goings of tourists and at the end of the season, being the one who is forgotten. “The Flames Are Coming Back” is of one who is trying to turn a life around and the struggle to keep things together for a family. “When You Were Doing Cocaine” gets right to it with the shock of a corrupted life affecting others and the piece is sewn together with an almost lullaby of a melody and the dreamy irony of a chorus that beckons for a better place. In the music business today, many artists demand to be seen and heard, but F.M. Cornog as East River Pipe, true to himself, quietly sings of those who exist below the din of a world flashing by. This entry was posted on March 14, 2012 by wajobu. It was filed under Uncategorized and was tagged with AffordableAudio, Daily Audiophile, East River Pipe, FM Cornog, Fred Cornog, Merge Records, Music, Vocal.